PharmaFreak announced a new series of products branded Freakmode Series. The Andro Freak is one of the new products in the series, an entirely new testosterone booster that is supposed to be the company’s leading test booster, replacing the older Anabolic Freak and Test Freak which ranked high on a lot of top 10 lists. In this Andro Freak review, we will tell you what’s in it and what you should expect it to do. 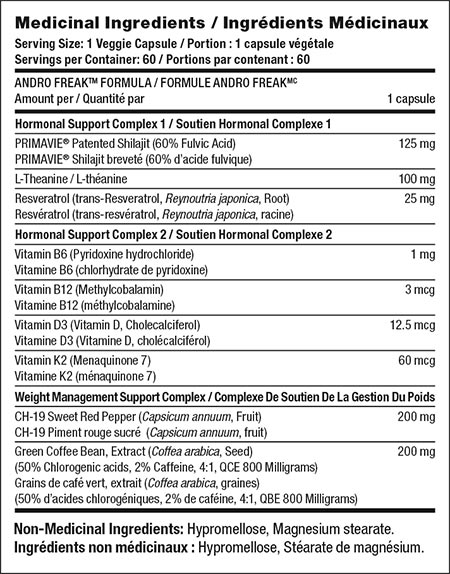 Andro Freak comes in capsules, with every serving made of one capsule only. It claims to be a source of healthy testosterone and hormone level support. It does so with some unique ingredients, which make it completely different compared to PharmaFreak’s previous test boosters. This is one of the longer labels you’ll see today so be patient as we take you through the highlights here. 125mg PrimaVie shilajit – PrimaVie is a clinically studied, purified Shilajit from the Himalayas, which supports male sexual health, mitochondrial energy booster, increases exercise endurance and overall fitness level. This complex is made of 4 vitamins – B6, B12, D3 and K2. Vitamins are commonly used to serve as additional nutrients which are always welcome in every supplement. Both of these ingredients are all about weight management. It starts with 200mg CH-19 Sweet Red Pepper, a metabolism booster that helps with reducing weight gain, especially when on a high-fat diet. Next, comes 200mg Green Coffee Bean Extract, a common fat burner, and weight loss ingredient. PharmaFreak Andro Freak presents an interesting formula for a test booster. It has the test booster ingredient in PrimaVie but it also has other ingredients that give all sort of benefits that you wouldn’t expect in a standard test booster. PharmaFreak did mention that the suggested way to take Andro Freak is 2 capsules per day, one in the morning and one before going to sleep. PharmaFreak went on a very interesting journey with Andro Freak, This is not your grandma Test Booster, with only one ingredient specifically targeted at test boosting, you can look at Andro Freak as a hybrid hormonal support & Test Boosting supplement rather than a pure play.